Clearly Susan' hand painted bowls can be used for anything, cereal, soup, salads so wouldn't you love to serve your family and friends in lovely bowls custom hand painted in a design of your choice? 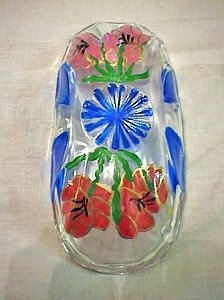 Our hand painted glass salad bowls come in a variety of sizes and styles. If you don't see what you like and are looking for a particular shape we can gladly find what you are looking for. Our bowls can be used for also, desserts, cereals, but come hand painted to match any dinnerware sets. Some of our designs include Hand painted bowls in Amaryllis design, Purple Wisteria, Yellow Wildflowers, Blue Savoy. We love to take our inspiration from nature which in turn would provide a lovely garden party for you and your quests.